The following list includes academic works pertaining to Holocaust content or museum studies and public history. I have included a brief annotation for each reading. This works were used to enhance my experience at USHMM and the work I produced for the course. 1. Belcher, Michael. Exhibitions in Museums. United States: Smithsonian Publishing, 1993. This work is a preliminary guidebook for exhibitions in museums and includes assessments of what they require in terms of costs and planning, their importance to a museum’s mission and visitor experience, and how to bring them to fruition. The author discusses the need for museum policy and a clearly defined mission to which all planning and development can follow. Assessment includes: mediums of communications within an exhibition, the design and modes of exhibits, and the role that visitor orientations plays in their reasons for visiting and overall experience. This work provides a firm understanding of the importance of exhibitions within a museum and the detailed processes one must go through to produce an exhibition. 2. Berenbaum, Michael. 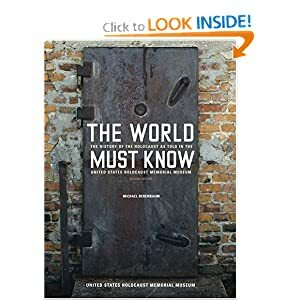 The World Must Know: The History of the Holocaust as told in the USHMM. John Hopkins University Press, 2005. This is a larger book, prepared by Michael Berenbaum who was heavily involved in USHMM’s planning and development. This guidebook provides a wonderful foundation for Holocaust studies and provides a detailed synopsis of the story of the Holocaust (as told in USHMM). Berenbaum’s work includes testimonies and pictures that are included within the museum or saved in the extensive archives and collections. I was given this as a gift for my service as an intern at USHMM, and even though I already had a firm understanding and knowledge of Holocaust studies, this book helped to fill in many gaps. It also added a human touch through the testimonies and personal accounts, much like the victim perspective which is told within the museum. 3. Fahy, Sara. Collections Management. Routledge, 1994. This work is a collection of articles and essays which explore the management of collections within museums and institutions of various sizes and across the world. Fahy addresses the necessary policy making with surround and affect collection work. Essay topics include: developing collections and management policies within a museum, documentation, researching and acquiring collections, and disseminating the information surrounding the collections to the public. This work overlaps with the work on exhibitions in museums and the combination of both provide a framework for these important aspects of museums. (You can not have one of these without the other) This work also stresses the importance and necessity of both to a museum’s existence. Finally, these essays are diverse as they focus on a variety of museums around the world, including the United States, Great Britain, Australia, and so forth. This helps to shed light on international attitudes regarding museums and the different policies that exist around the globe. 4. Linenthal, Edward. Preserving Memory: The Struggle to Create America’s Holocaust Museum. Columbia University Press, 2001. Linenthal’s work chronicles the struggles, debates, and processes behind the development and construction of the United States Holocaust Memorial Museum. Linenthal presents and assesses its history, the purposeful nature of the building’s architecture and design, and highlights several of the controversies surrounding the displays. This went along really well with my internship experience and solidified an understanding of the work, process, and planning that goes into museum mission statements and policies, exhibitions, collections, and so on. This book and the creation of the Holocaust museum touches upon all aspects of Public History– both behind the scenes and on the front lines with visitors. 5. Rees, Laurence. Auschwitz: A New History. New York: Public Affairs, 2005. This work provides an in-depth examination of Auschwitz death, concentration, and labor camp network. Rees presentation and use of sources culminates in a work on Auschwitz that differs from other scholarly works on the subject. Rees assesses Rudolf Hoss’s role as commander of the camp, as well as other Nazi SS officials and perpetrators. Throughout his examination, he includes interviews and oral testimonies not only from victim survivors but from Nazi perpetrators as well- thus providing a perspective that is not often heard. It is surprising, as Rees notes, that many of these perpetrators still believe that they were justified in their actions. This work follows the process of killing techniques and the development of Auschwitz into the most effective and efficient killing machine during the Holocaust. Finally, this book demonstrates the mindset of humanity and provides insights of Nazis and human behavior. 6. Wood, E. Thomas. Karski: How One Man Tried to Stop the Holocaust. Wiley Press, 1996. This book reads like a narrative and has been retold based off of Karski’s recollections through exhaustive interviews and oral histories. 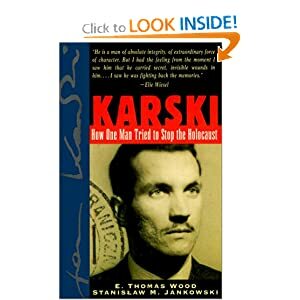 Wood not only utilized Karski’s first-hand accounts and memories but he employed other sources which include: other interviews, scholarly works, government or official documents. This tells the story of Karski’s experiences during the war, exposing the lengths he went to to try to protect Polish Jewry and prompt government bodies in London and DC to take action. Karski originally was recruited to serve in the Polish underground as a courier. After escaping from the Gestapo he met with leaders to speak about the atrocities being committed against Jews. This book, as the author admits, “cannot escape the explosiveness of Polish-Jewish relations (x). Karski received honorary awards for his work against Holocaust atrocities. He later moved to the U.S. where he became Professor Karski. 7. Young, James E. Texture of Memory: Holocaust Memorials and Meaning. Yale University Press, 1994. This work addresses the issues surrounding memory and memorialization by utilizing critiques and assessments of various Holocaust memorials. While these assessments do focus on Holocaust related memorials, the author indicates his work lends to the scholarship and debate surrounding memorialization at large. Young begins by highlighting the monument vs. memorial debates as well as remembering vs. never forgetting debates, both of which surround the topic of memorialization. The work examines Holocaust monuments and memorials in European countries, Israel and America. In all three instances, Young addresses the role memory plays in constructing national identity and the collected past. The section which addressed USHMM in D.C. was of particular interest and relevance to me. Young proposed three major reasons as to why the Holocaust is and should be significant to Americans. Finally, he describes the layers of memory which include topography, architecture, and exhibitions. He assesses all three of these in relation to USHMM’s development and design. This is a good work to add to scholarship regarding memory and the debates surrounding it. 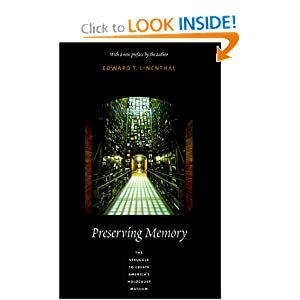 More specifically, it is a great read that ties the larger concept of memory to the specific content of Holocaust memorialization and meaning.